1 high-ranking music artist will be selected by Kaki King for 3 opening performances on her Spring 2008 Tour: April 4, 2008 at Higher Ground in Burlington, VT; April 5, 2008 at the Paradise Rock Club in Boston, MA; April 6, 2008 at Iron Horse in Northampton, MA. The winning artist will also have a one-on-one mentoring session with Kaki King. All high-ranking artists from February and March are eligible. 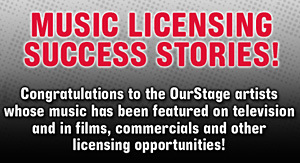 Artist selection made jointly by Kaki King and OurStage. Prizes will be awarded according to the OurStage monthly competition terms and conditions; No additional expenses covered.